Natural Hot Spring Penatahan, located not far from Jatiluwih tourism. 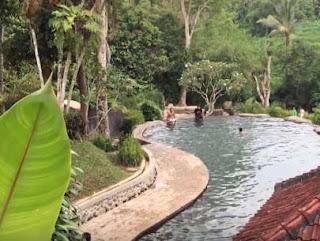 Entering the main area of ​​the Penatahan Hot Springs, you will be greeted with neatly arranged gardens and 3 public bathing pools that you are ready to use for bathing. The Penatahan Hot Spring area in addition to offering beautiful views of the gardens, also presents the beauty of the Ho river and views of terraced rice fields across the river, this beautiful natural bandage feels like a place of perfect relaxation, calm and peace. The source of the spring itself comes from Penatahan Temple which is near the bathing pool. The hot water source is then filtered and connected through a pipe to each pool in the bath. Thanks to the sulfur content in it, soaking in hot water is believed to eliminate rheumatism, aches, skin diseases, and so on. In my opinion, it makes sense, because I myself have an acne medicine that has sulfur or sulfur content and is very effective at removing acne in a short time. Penatahan Hot Water is very well managed, the gardens are spacious and well organized, so it is quite entertaining and soothing, in this area there is a 3 star hotel, ESPA Yeh Panes Natural Hot Spring Resort, you are planning a vacation and want to enjoy the beauty and keep away from the noise of the city in a beautiful natural countryside, ESPA Yeh Panes Natural Hot Spring Resort, can be a special place to stay for families.